If you ask me what I miss most about living in Scandinavia, besides the better air quality and slower pace of life, it has to be the awe-inspiring scenery. Fjords. Ice hotel. Snow-clad hills. Glaciers. There are the things that you don't get to see every day and when you do so, they just take your breath away. Add reindeer sledding and snowman building into the list, and I can understand why winters can be not just beautiful, but fun as well. 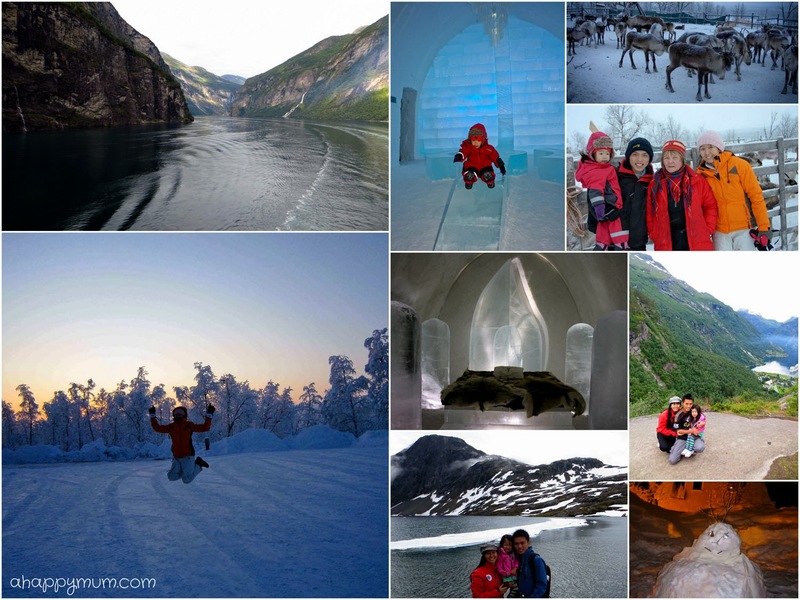 What if I were to tell you that come this school holiday, you and your family can have the opportunity to witness the stunning beauty of ice, snow, glaciers and fjords in one go? No, it's not a dream, just perhaps a dream come true. 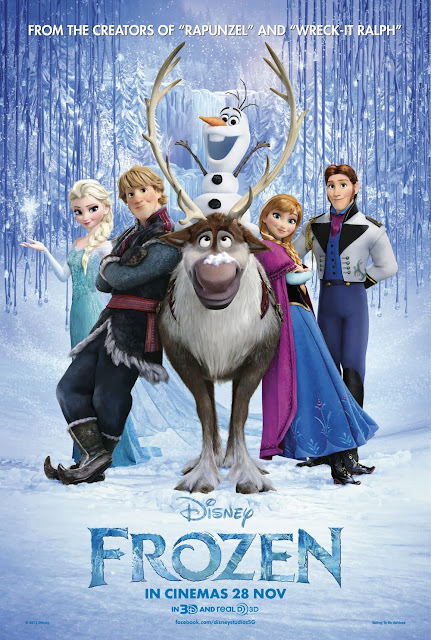 Walt Disney Animation Studios presents to you "Frozen", a spectacular big-screen comedy-adventure filled with action, adventure, magic and memorable characters. Set in the fictional kingdom of Arendelle inspired by Norway’s impressive landscapes, "Frozen" is a powerful, heartwarming story about fear versus love, told through a family’s epic journey as they strive to overcome fear and find the true meaning of love. ANNA is bold, carefree, optimistic and at times goofy, often speaking before she thinks. She longs to connect with her elder sister and when she accidentally found out about the magic secret and caused Arendelle to be locked away in an eternal winter, she sets off on a dangerous, exciting adventure - with nothing else but her courage and perseverance - to save her sister and the kingdom. 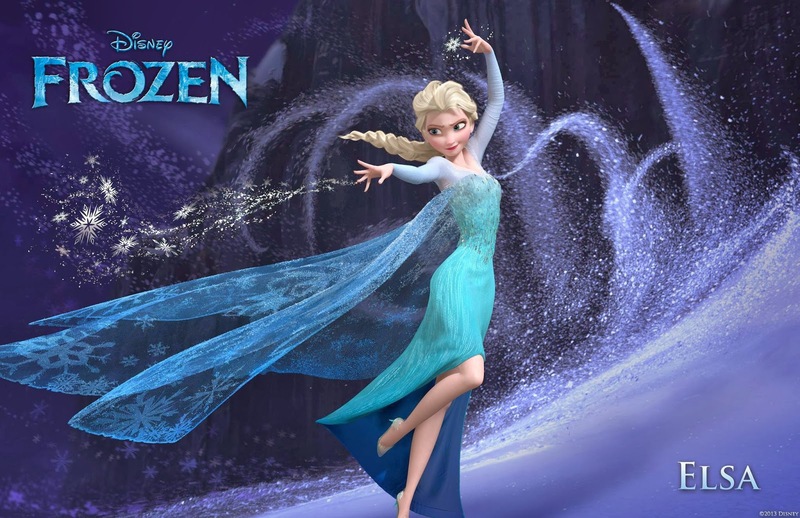 ELSA is steadfast, composed and may even be perceived as cold. Born with the power to create ice and snow, and haunted by the childhood memory where her magic nearly killed her younger sister, she lives in an isolated world and fights hard to suppress her growing powers.When she flees the kingdom in order to avoid hurting others, she instead found the freedom to accept and celebrate for who she is. KRISTOFF is strong, rugged and charming in his own distinct ways. A mountain man who sells ice for a living, he is unexpected and can be a little rough around the edges but he is definitely the perfect companion on an epic adventure. I really appreciate how the team at Disney did extensive research and travelled up to Norway to learn about its landscape, architecture, mythologies and culture. 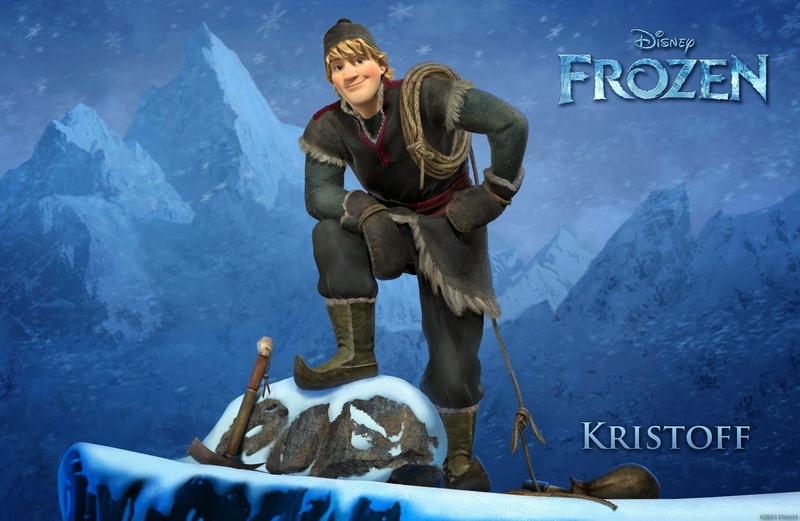 For instance, Kristoff's costume and way of life truly reminded me of the Sami people we met in Kiruna, Sweden. 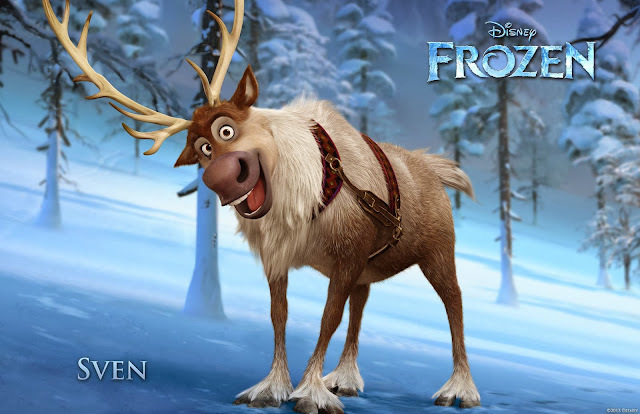 SVEN, an adorable and loyal reindeer, is Kristoff's best buddy. He doesn't say a word and only gives a few empathetic snorts along the way, but at times he knows best and it was him who inspired Kristoff to hang on to his true love. Interestingly, in order to study the physical makeup and mannerism of Sven, a real reindeer was brought into the studio and later caricatured in the making of Sven. 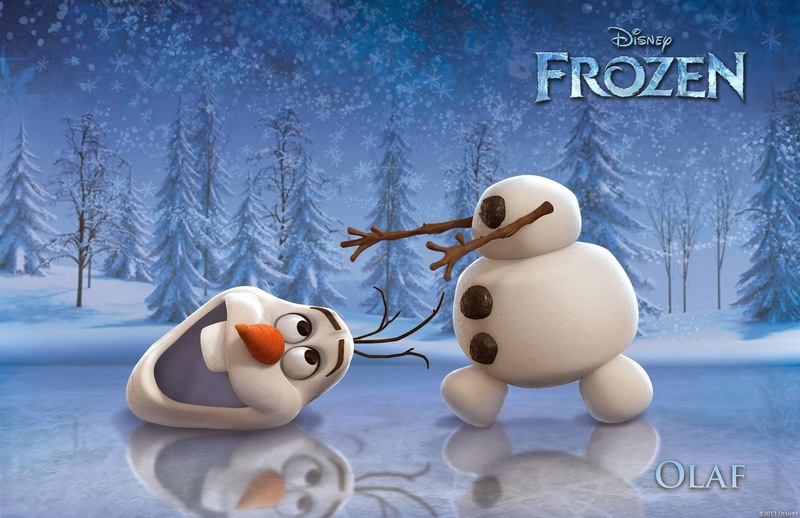 Last but not least, OLAF is my favourite character in the show - a snowman who loves warm hugs. Ironic, yeah? Wait till you see and hear about his summer fantasies, I bet that will make you chuckle. He is funny, innocent, affectionate and everything he says has the power to make the audience melt. We were thankful to have had the opportunity to watch "Frozen" at the media preview this week and I have to tell you it is by far my favourite Disney film of the year. Besides being awed by the stunning visuals and captivated by the catchy original songs, I love how the story weaves in the theme of family and talks about the power of sisterly love. In addition, the girl and I fell in love with the songs so much that the first thing we came home was to search for them online and keep humming to them for the entire night, our favourite being "Let it go". We also watched the movie trailer again and again and even watched the behind the scene clips. Funny. Magical. Majestic. Stunning. Unexpected. Thrilling. It's everything you expect out of a Disney film and more. I have never thought I would want to watch an animated film twice, but for some reason, I just wish to see this movie a second time. Maybe even third. Is the show really that good? Don't just take my word for it, go watch it and let me know what you think. 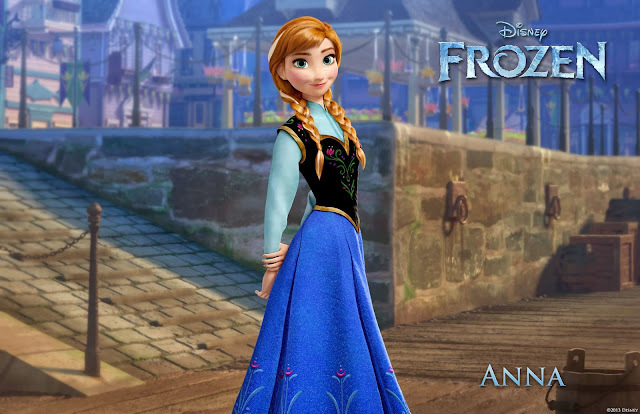 "FROZEN" opens in cinemas in 3D on 28 November 2013. Leading up to the release of "Frozen", in conjunction with Walt Disney Studios Singapore, Cathay Cineplexes presents Disney’s Princess Film Festival from 16 to 27 November. 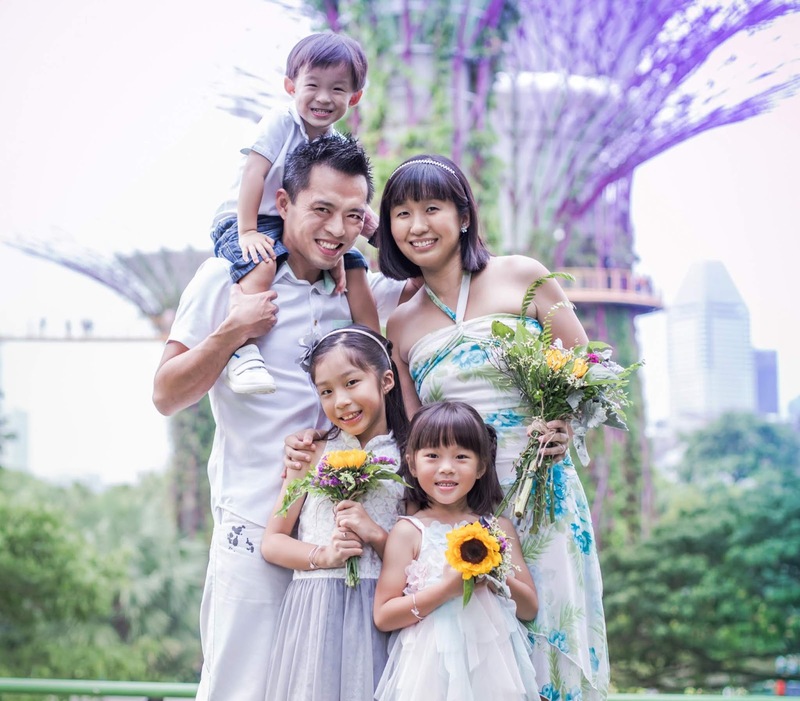 During the festival, five classic Disney Princess movies will re-run at Cathay Cineleisure Orchard and Cathay AMK Hub. 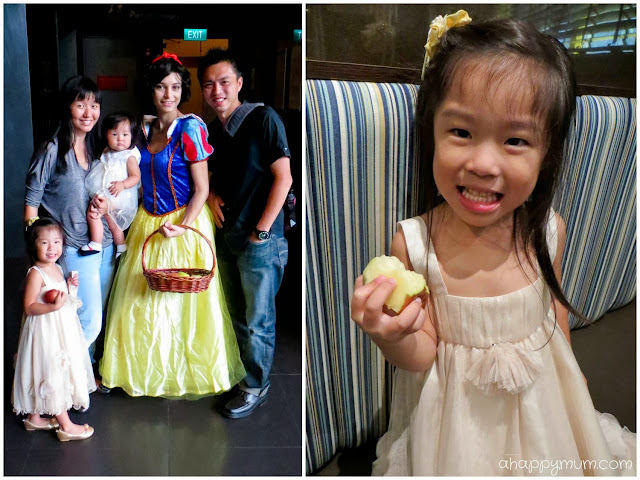 Not only were we invited to watch the classic Snow White movie and reminsce a good old Disney film, we also got to meet and greet Snow White, much to Angel's delight. You know, after the show ended and Angel learnt about witches and poison, she turned to me and said "Mummy, just now Snow White gave me an apple and I ate it. Erm. Will I be ok?" Which, of course, made me laugh out loud. Kids, their innocence is what makes them so endearing. As for baby Ariel, she was lucky to catch the caricaturist in the nick of time and be the last one to receive a beautiful piece of caricature that day, with her portrayed as the Little Mermaid. Seeing this, Angel couldn't help but feel a little down in the dumps because she couldn't have her own portrait drawn. So, guess what? The hubby and I had a Caricature Contest when we got home and surprised Angel with our, ahem, work of art. TA-DAH! Guess which is mine? When we asked Angel which she preferred, she chose the one I drew without even hesitating or asking who the artist was. Did you guess it? The one on the left is drawn by yours truly. The one on the right by the hubby reminds me of, well, Jackie Chan. 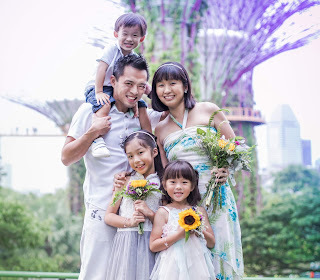 So, with the festive season around the corner, have you lined up any plans for your kids? 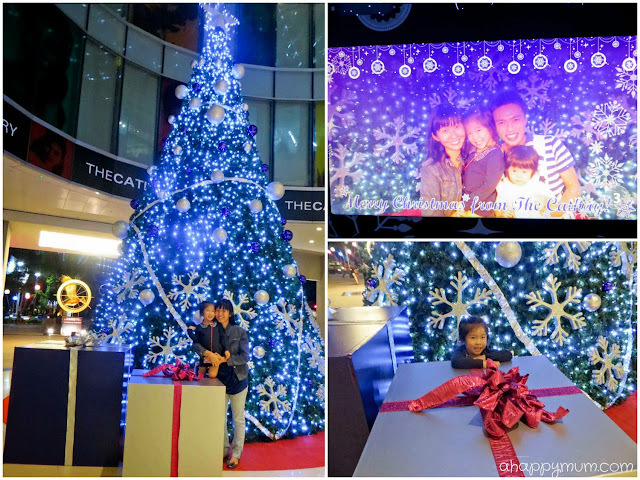 Do check out some Christmas lightings (this was taken outside The Cathay and we could even take our photo inside the giant Christmas tree which will be uploaded on their Facebook page), go shopping for gifts, munch on festive goodies and have awesome gatherings with family and friends. 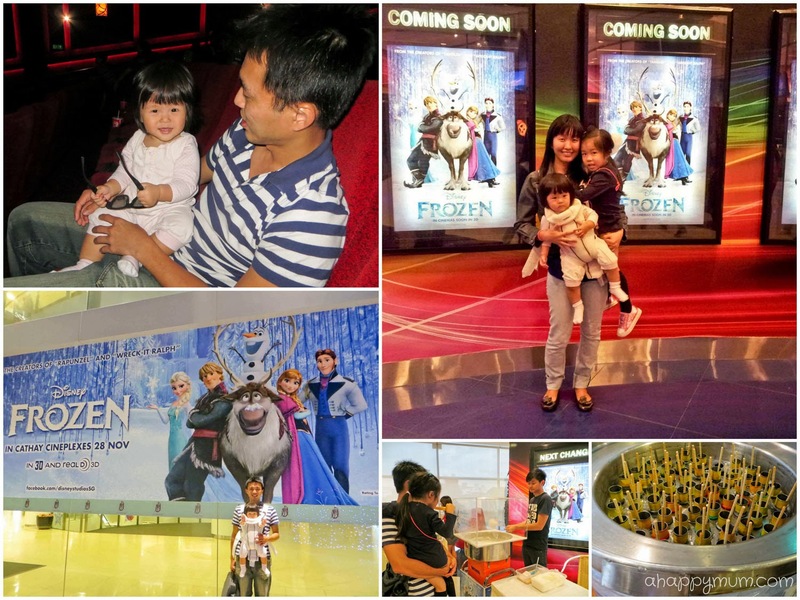 Oh, and do remember to find some time to bring the kids to watch "Frozen", yeah? 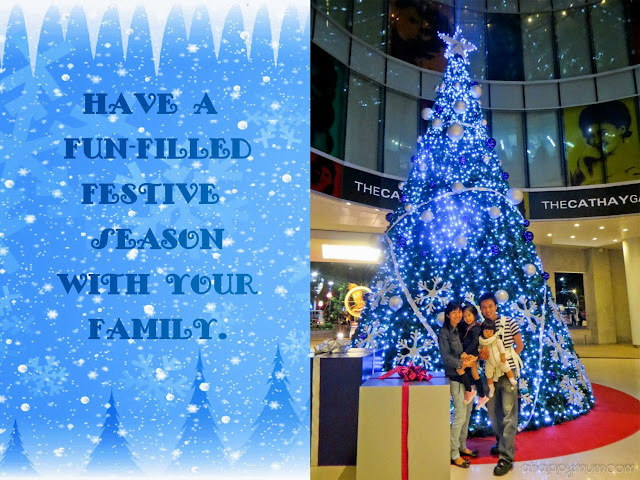 It is going to be an awesome treat for everyone in the family. 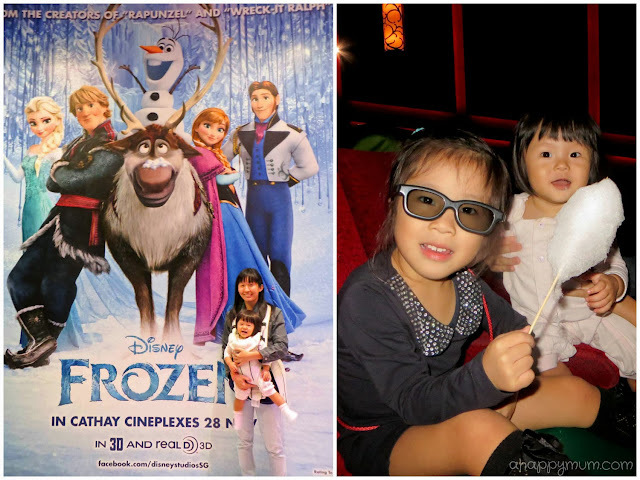 Disclosure: We were invited to the media preview of "Frozen" held at The Cathay and received free popsicles and candy floss. No monetary compensation was received and all opinions are our own.